The complete Product News section from the January/February 2014 issue of Gear Technology. The complete Industry News section from the November/December 2013 issue of Gear Technology. The complete Product News section from the March/April 2015 issue of Gear Technology. Safe cutting tool clamping, superfinishing gear shafts, gearbox parts cleaning, gear deburring and more new gear-related products. Look beyond the obvious, and you may well find a better way to machine a part, and serve your customer better. That’s the lesson illustrated in a gear machining application at Allied Specialty Precision Inc. (ASPI), located in Mishawaka, Indiana. The complete Industry News section from the January/February 2014 issue of Gear Technology. 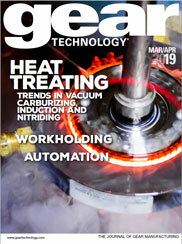 The complete Industry News section from the November/December 2012 issue of Gear Technology. Whether you spent time at Gear Expo in Indianapolis or EMO in Hannover, there was certainly new technology attracting attention. Machine tools are faster, more efficient and can integrate numerous functions in a single setup. Grinding technology is turning science upside down and inside out with high-speed removal rates and increased throughput. Recent breakthroughs in profile grinding software are helping Anderson Precision Gears and others meet wind power’s insatiable appetite for faster production of large, high-quality gears. When parts you manufacture pass through numerous processes such as deep hole drilling, machining, hobbing and grinding, a CMM is essential when your customers require 100 percent in-process and final inspection. The complete Product News section from the October 2013 issue of Gear Technology.